If you already tried Windows 7 and so far you like what you see and looking forward on using it for good, then this Windows 7 Shortcuts Master List can make you be a more effective Windows 7 user. Windows keyboard and mouse shortcuts can dramatically increase user productivity by speeding-up windows navigation, folder manipulation, application switching and etc. The following list are compilation of Windows 7 shortcuts which are categorize by two types, one is keyboard shortcuts and the second is shortcuts by mouse interaction. Win+Home: Clear all but the active window. - Drag window left/right: Dock the window to fill half of the screen. - Double-Click Top Window Border (edge): Maximize window vertically. 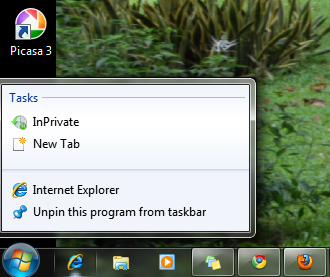 Win+Alt+number (1-9): Opens the Jump List for the application pinned to the taskbar.